He picked up the phone and dialed. “Dad, I’m coming back to the farm in five years,” he said. He yearned to return to his family’s 300 milking cows in upstate New York, where he’d grown up in a big yellow house overlooking Cayuga Lake. He’d always enjoyed the peaceful serenity of milking. Chandler’s dad, Chuck Benson, was thrilled. He had made a similar decision, although under different circumstances. When he was a young man in the Peace Corps, advising Colombian cattlemen on hay crops and animal husbandry, he wrote a letter to his own father to ask about becoming a partner in the family dairy farm. we could put that off for another generation,” Chuck says today. Aziza neared the end of her commitment to the Coast Guard and was ready to begin her new chapter with her husband on the Bensons’ farm. She says that although she grew up in inner-city Chicago, her family had always had a small garden. “We’re earthy people, so we were never too far removed from where food comes from,” she adds. The Bensons’ farm has always been a dynamic, changing place. Chandler’s grandfather bought the original 200 acres of land and started the dairy with just seven cows in 1946, the year Chuck (Chandler’s father) was born, and added innovations—a milking parlor, bunker silos, a freestall barn, a waste lagoon—as the family and the farm grew. Chuck and Andra took over the farm in the early 1970s, just as Chuck’s parents were ready to retire. In time, they grew the land to 1,000 acres, 300 milking cows, 300 replacement animals, and three barns. During the 1990s, they began pasturing the cows. Andra, who managed the bookkeeping, was frustrated with volatile milk prices, never knowing how much money to count on from month to month, never being able to make an accurate budget. She felt that milk-buying corporations appeared indifferent to struggling farmers, even when they offered onetime cash-signing bonuses. Both she and Chuck were uncomfortable with mixing chemicals and applying them on their fields. So when Andra learned that Organic Valley would help with their organic certification and offer stable pricing, she was excited to become a member-owner in the cooperative. She began the paperwork, had their pastures certified, and took out a loan to buy organic feed to sustain the animals while their cropland was in transition. And in 2007, the year they completed the certification process, she and Chuck relocated to their new earthen home built into a hillside just down the road from the original homestead and featuring a west-facing, passive-solar facade. 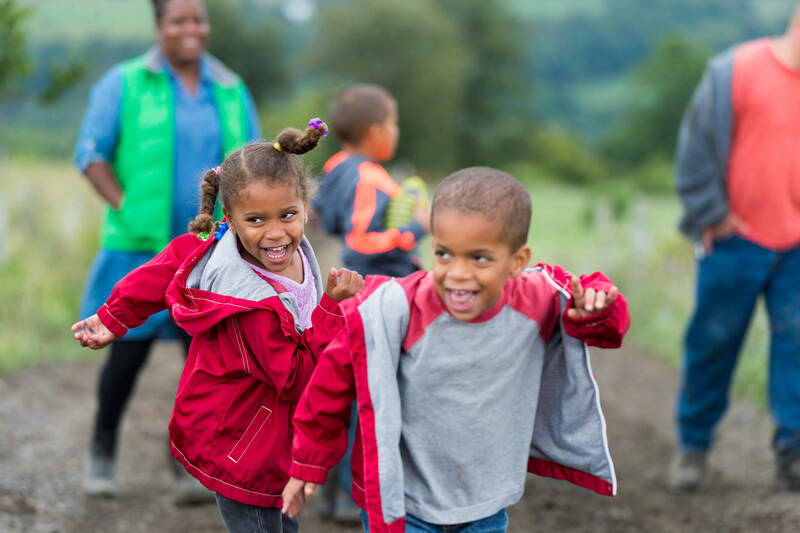 Chandler and Aziza arrived that year with their 2-year-old twin daughters and another set of twins on the way, marking the fourth generation of Bensons on the farm and the seventh generation of twins in Aziza’s family. Chandler began working as farm manager while his parents continued to oversee the entire business. 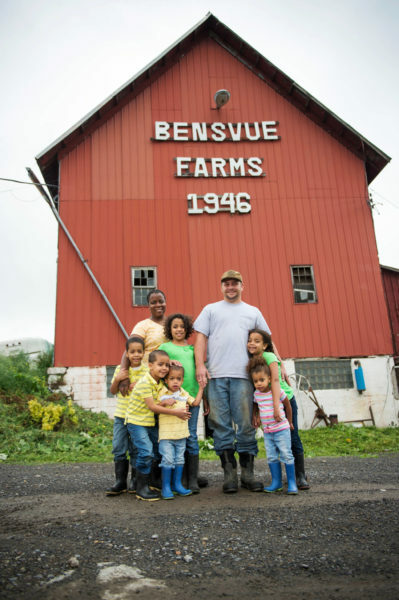 In 2011, Chandler and Aziza became owners of the family operation, known as Bensvue Farms, just as their third set of twins was born. That summer, the region experienced extreme drought. The cows couldn’t graze much on brown pasture, and the crops didn’t yield enough feed to last through the winter. Because corn prices were high, the cows weren’t fed as much as usual and therefore didn’t produce as much milk. With circumstances like that, “it’s hard being business owners,” Aziza says. They got by with relief from government and Organic Valley programs. Chandler and Aziza keep looking to improve the business, as previous generations have. Recently, Aziza reconsidered their harvesting operations. The family had always done its own harvesting: mowing crops, merging windrows, chopping vegetation, and trucking it back to the bunker silos to ferment into silage or haylage. When equipment broke down, the farm manager worked to fix it. Aziza realized that a lot of the farm manager’s time was wasted on repairs when his expertise could be better used mentoring Chandler. What’s worse, adds Chandler, if an equipment failure interfered with the timing for the harvest, the forage was at risk of not fermenting properly, turning it into moldy waste. In light of these costs, Aziza proposed switching to an outside harvester. Now the family contracts the job to a person with a reliable workforce and new equipment, and the harvesting is finished in a third of the time that it was previously. With the help of an Organic Valley grant writer, Aziza also recently applied for a New York State grant to buy a baler so that the family can harvest fields of rye and triticale too small for the contractor. Chandler is investigating the possibility of having dedicated nursing cows feed and care for the calves, a system his neighbor uses to reduce human labor and improve calf health. For now, the eldest Benson daughters help Grandma Andra take care of the calves, and the younger kids feed the family chickens and collect eggs. One of Chandler’s brothers, who lives on the same road, serves as the farm’s large-animal veterinarian. Chuck and Andra continue to offer advice. “Farming as we know it is a family commitment,” Chuck says. This article originally ran in the spring issue of New Farm Magazine, the magazine of Organic Farmers Association. All members receive a complimentary issue of New Farm twice per year. Join today. Alison Fromme lives in upstate New York and has written for National Geographic, Discover, and other national publications. In 2015, she was awarded a National Association of Science Writers Career Grant.